[handwritten in top let corner] 2 [handwritten] Contractor for development of the * balloon: "Molded Latex Products, Inc. Paterson, New Jersey. 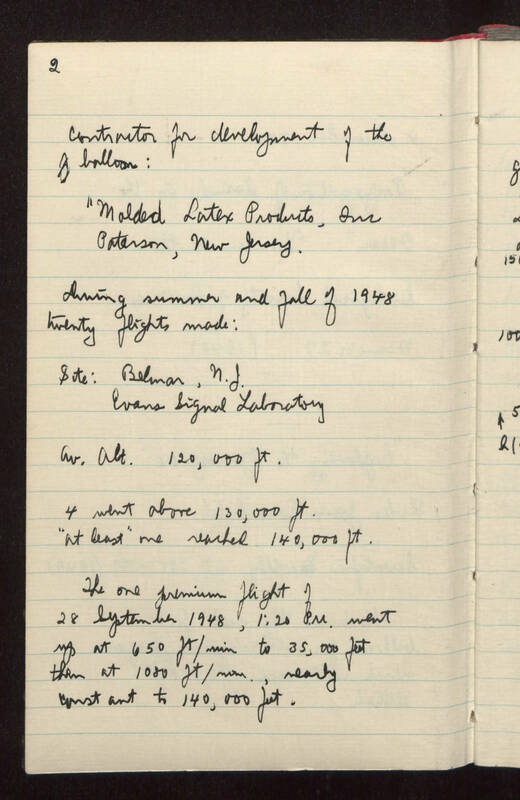 During summer and fall of 1948 twenty flights made: Site: Belmar, N.J. Evans Signal Laboratory Av. alt. 120,000 ft. 4 went above 130,000 ft. "at least" one reached 140,000 ft. The one previous flight of 28 September 1948, 1:20 P.M. went up at 650 ft/min to 35,000 feet then at 1080 ft/min, nearly constant to 140,000 ft.